Then we can rejoin the EU. Perfect result. Apparently David Davis was going to resign but assumed he could keep his ministerial car and salary under a bespoke deal which turned out not to be available. There’s lots of petty point scoring between posters on here, but as a country we seriously need to have a long hard look at where we are and where we are going. There’s about 9 or 10 months to go and the country is hardly any further forward. The political parties have internal divisions over this and the government is beset by internal squabbling between the remainers and the brexiteers to the extent the prime minister appears too afraid or unable to make any decisions. She also needs the support of the DUP which may not be guaranteed as there are potential issues emerging over women’s rights and abortion. For the sake of our service and manufacturing industries this needs to be sorted, our and our children’s future prosperity depend on it. Unfortunately this is what you get when a slim majority vote on a blank sheet of paper hoping for the details to be filled out later. 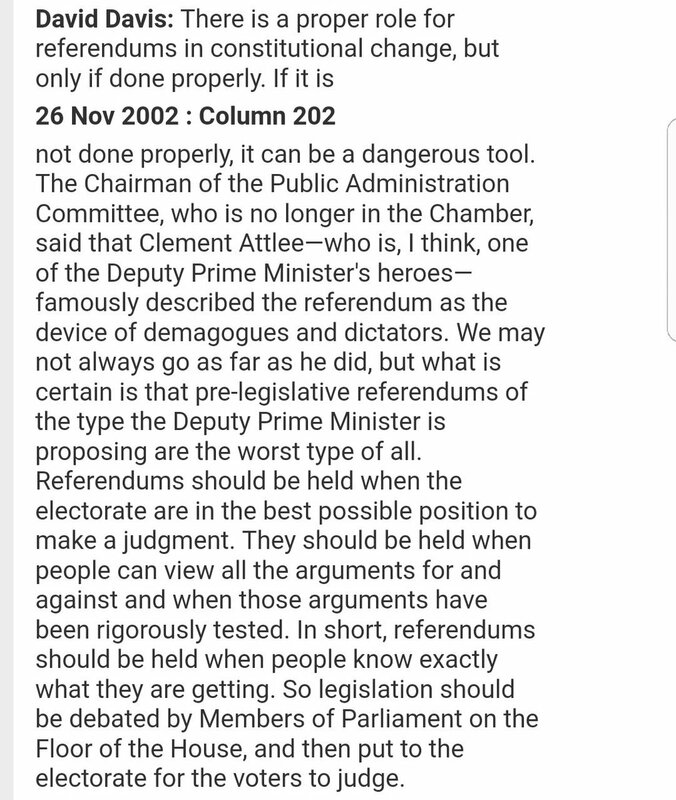 David Davis once said in 2002 that referendums are dangerous and should only be held "when people know exactly what they are getting". No, this is what happens when arrogant elected mp’s go against the will of the people and try their upmost to derail the Brexit process. If everyone had done what they are paid to do and got together, as a team the day after the vote and came up with the best plan to get the best deal, regardless of which way they voted, we would be in a far stronger position. Instead we’ve had half of parliament acting like spoilt children putting their self interests before the country and it’s become a mess. There was a referendum, Brexit won, end of chat. If it doesn’t get followed through then it’s a sad state for this countries democracy. Why would people who voted leave ever wanna vote again, it doesn’t mean anything. 50 odd pages and flying to 100,000 views and this is the truest post of the lot. So you agree with me that brexit vote was on a blank piece of paper, and that was exactly what DD warned against back in 2002. But then Cameron used it as a tool to shut up the loony right in the Tory Party and his strategy backfired. Cameron rides off into the sunset leaving the loonies in the ascendancy. Thank God that the U.K. has a strong parliamentary tradition. Parliament is sovereign and will see to it that common sense triumphs over sheer stupidity. BuzzFeed , June 7, 2018, at 7:40 p.m.
BuzzFeed News has obtained an audio recording of a closed-door gathering at the Institute of Directors in London, where Johnson treated about 20 Tories to an extraordinarily unguarded and wide-ranging assessment of the UK’s foreign policy strategy – and his private thoughts about Brexit, Donald Trump and Vladimir Putin. Johnson praised Donald Trump, warned that China will “try and stiff us”, and said Putin was embarrassed that Russia’s economy is now smaller than that of Australia. Boris Johnson discusses how Donald Trump would approach Britain's Brexit negotiations. Speaking about Brexit, Johnson gave a remarkably candid rundown of the arguments that have bitterly divided May’s cabinet. At the time the dinner took place, the rest of Westminster was gripped by speculation about the future of another disgruntled Brexiteer, David Davis, but Johnson revealed to the activists that he, too, is gravely worried about the direction of the talks. Johnson insisted he won’t compromise on the final terms of Britain’s future economic relationship, but said the Brexiteers were at risk of getting a deal far worse than they’d hoped for. The government is so terrified of short-term economic disruption that it’s at risk of throwing away the opportunities presented by Brexit. He ridiculed the concerns about disruption at the borders as “pure millennium bug stuff” and said it’s “beyond belief” that the Northern Ireland border has become an obstacle in the negotiations. Load of crap. Brexit would be a success if it wasn’t for MPs who didn’t get their way, trying their damnest to stop it. There’s plenty of scaremongering reports that people have changed their mind but that’s rubbish also. I haven’t come across one person who voted to leave that’s changed their mind and I work all over the country. It’s quite easy to fabricate polls to suggest otherwise and people like yourself lap it all up. How many times have you lot been told. Let’s be honest, the strategy now being deployed by the losing side, is to muddy the waters, make everything more complicated than it needs to be. Throw in some scare stories and hope there’s another referendum. It’s not going to work, we had the biggest exercise in democracy this country has ever had, and the result is to leave. Sorry I misread what you wrote but still thinks it’s a load of crap. If all the MPs had got together and worked as a team as they should have, as they are paid to do, then it would have been a far easier deal to negotiate.They didn’t, some never had any intention of trying to get the best possible deal for us. It’s not only wrong but it’s embarrassing the way the remain side have behaved. You’re deluded if you think otherwise. you still makeout that nobody knew what they voted for, everyone had their own reasons for voting, only arrogant idiots suggest otherwise. You may think you know better than 17.4 million people but you don’t, you’re in the minority in fact. It looks like 'blank piece of paper' is the latest phrase invented to denigrate over 17 million people. I wonder what the next one will be? My ballot paper definitely had some writing on it. Can't speak for anybody elses.